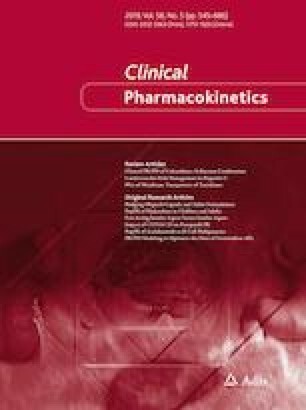 The 24-h area under the concentration–time curve (AUC24)/minimal inhibitory concentration ratio is the best predictive pharmacokinetic/pharmacodynamic (PK/PD) parameter of the efficacy of first-line anti-tuberculosis (TB) drugs. An optimal sampling strategy (OSS) is useful for accurately estimating AUC24; however, OSS has not been developed in the fed state or in the early phase of treatment for first-line anti-TB drugs. An OSS for the prediction of AUC24 of isoniazid, rifampicin, ethambutol and pyrazinamide was developed for TB patients starting treatment. A prospective, randomized, crossover trial was performed during the first 3 days of treatment in which first-line anti-TB drugs were administered either intravenously or in fasting or fed conditions. The PK data were used to develop OSS with best subset selection multiple linear regression. The OSS was internally validated using a jackknife analysis and externally validated with other patients from different ethnicities and in a steady state of treatment. OSS using time points of 2, 4 and 8 h post-dose performed best. Bias was < 5% and imprecision was < 15% for all drugs except ethambutol in the fed condition. External validation showed that OSS2-4-8 cannot be used for rifampicin in steady state conditions. OSS at 2, 4 and 8 h post-dose enabled an accurate and precise prediction of AUC24 values of first-line anti-TB drugs in this population. Little information is available on sampling strategies in early TB treatment and in different conditions. This study investigated optimal sampling strategies (OSSs) to estimate area under the concentration–time curve from time zero to 24 h (AUC24) of first-line anti-TB drugs in early treatment and in different conditions. An OSS at 2, 4 and 8 h post-dose accurately predicted the AUC24 of first-line anti-TB drugs in fasting and fed conditions in early treatment. These OSS equations support the therapeutic drug monitoring programmes aiming to personalize oral dosing for adult TB patients. Tuberculosis (TB) is a major problem worldwide. It is a curable disease but, nevertheless, 1.7 million people died from TB in 2016 . The reported treatment success rate for drug-susceptible TB ranges from 60 to 83% , meaning that healthcare providers encounter treatment failure in daily practice. The World Health Organization (WHO) aims to end the global TB epidemic by 2035 through several pillars and component goals, some of which are intensifying research and innovation by the development of new strategies and optimization of implementation of treatment . Optimization of treatment is imperative to increase the success rate of first-line treatment. First-line treatment of TB consists of isoniazid, rifampicin, pyrazinamide and ethambutol for the first 2 months, followed by isoniazid and rifampicin for 4 months . Clinical trials and observational studies have shown that low drug exposure of first-line drugs is associated with slow response to treatment, acquired drug resistance, and relapse [3, 4]. Several factors, such as malabsorption, pharmacogenetics of N-acetyltransferase 2 (NAT2), intraindividual differences in pharmacokinetics (PK), or food intake, may lead to low drug exposure [4, 5, 6]. Treatment optimization can be achieved by increasing adherence  or studying new or repurposed drugs [8, 9]. Another option is better attainment of the pharmacokinetic/pharmacodynamic (PK/PD) parameters that best predict the efficacy of first-line anti-TB drugs, i.e. area under the concentration–time curve over 24 h (AUC24) divided by the minimal inhibitory concentration (MIC) [AUC/MIC ratio] . However, actual MICs are often unavailable for first-line anti-TB drugs. Using classification and regression tree (CART) analysis, Pasipanodya et al. showed a clear concentration–effect relationship for the combination therapy of pyrazinamide, rifampicin and isoniazid . Therapeutic drug monitoring (TDM), which measures drug exposure and adjusts the dose to optimize drug exposure, has been proposed to improve treatment response in individual TB patients, especially in patients at high risk of treatment failure or delayed response [11, 12, 13, 14]. To calculate drug exposure, i.e. AUC24, a full concentration–time curve should be obtained by sampling up to 10 times during the dosing interval. The burden for both patients and the healthcare system hamper implementation in clinical practice [15, 16]. Therefore, there is an urgent need for alternative strategies to accurately estimate the AUC24. A limited or optimal sampling strategy (OSS) might be the solution. This method calculates which time points during the dosing interval (usually one to three) are most informative for the accurate prediction of AUC24 [14, 15]. Only a few studies in the literature have reported OSS for first-line anti-TB drugs [15, 16, 17, 18]; however, these studies mostly addressed administration of a single drug [15, 17, 18] in the fasting condition [16, 17, 18], and no studies examined OSS in the early phase of treatment. Meanwhile, the number of bacilli was high in the early phase of treatment, thus the risk of acquired drug resistance was higher when drug exposure was inadequate . One study described an OSS for multiple anti-TB drugs simultaneously, but, in that study, the time interval was limited to 6 h and was conducted in the fasting condition . To overcome the limitations of currently available OSS, we aimed to develop an OSS in the early phase of treatment to estimate the AUC24 of all first-line anti-TB drugs in fasting and fed conditions, as well as after intravenous administration. To develop the OSS, we used data from an earlier published prospective, randomized, crossover PK study approved by the Institutional Review Board at the Faculty of Medicine, Public Health and Nursing, Universitas Gadjah Mada (UGM), Yogyakarta, Indonesia (KE/FK/626/EC), and registered at ClinicalTrials.gov (NCT02121314) . From November 2012 to March 2013, 20 newly diagnosed, treatment-naïve adults with drug-susceptible TB received isoniazid 5 mg/kg, rifampicin 10 mg/kg, ethambutol 15 mg/kg and pyrazinamide 25 mg/kg. One patient was excluded from the study due to vomiting shortly after ingestion of the drugs on both days of oral treatment, and was replaced by inclusion of another subject. The study was performed on the first 3 days of anti-TB treatment. On day 1, all subjects received intravenous treatment of isoniazid (100 mg/mL injection; Department of Clinical Pharmacy and Pharmacology, University Medical Center Groningen (UMCG), Groningen, The Netherlands; license number 108964F), rifampicin (rifadin 600 mg injection; Sanofi Aventis, Guildford, UK) and ethambutol (EMB-Fatol 1000 mg injection; Riemser Arzneimittel AG, Greifswald – Insel Riems, Germany). Isoniazid was administered as a short infusion of 30 min, while rifampicin and ethambutol were infused over 2 h. Pyrazinamide was not available as an injection and was administered as a 500 mg tablet formulation (PT Indofarma, Bekasi, Indonesia) in a single oral dose on day 1. Participants were randomly assigned to one of the two treatment groups (fasted day 2 and fed day 3, or fed day 2 and fasted day 3). On days 2 and 3, a fixed drug combination containing 75/150/275/400 mg of isoniazid, rifampicin, ethambutol and pyrazinamide (PT Indofarma) was administered orally. Serial blood samples were collected at 0 (predose), 0.5, 1, 1.5, 2, 2.5, 3, 4, 5, 6 and 8 h after dosing, and were centrifuged and stored at −80 °C in the TB-Microbiology Laboratory of the Faculty of Medicine, Public Health, and Nursing, UGM, Indonesia, until transported on dry ice to The Netherlands, with the provision of a Material Transfer Agreement (UGM–UMCG, and the National Agency of Food and Drug Control, Indonesia; PN.01.06.1.31.11.12.7158). Plasma samples were analysed using validated liquid chromatography-tandem mass spectroscopy (LC–MS/MS) methods in the laboratory of the Department of Clinical Pharmacy and Pharmacology of the UMCG, The Netherlands, as previously described [20, 21]. Concentrations at time points 0 on days 2 and 3 also served as the 24-h concentration (C24) on days 1 and 2. The C24 on day 3 was calculated using the formula C24 = Cmax × e−β×(24−Tmax), in which β is the first-order elimination rate constant, Cmax is the maximum concentration measured, and Tmax is the time to reach Cmax. Plasma concentrations below the lower limit of quantification were treated as zero. The AUC24,calculated was calculated using the log-linear trapezoidal rule in MW\Pharm (Kinfit, version 3.60; Mediware, Groningen, The Netherlands); this AUC24,calculated represented the best approximation of the true AUC24. We conducted multiple linear regression analysis to obtain optimal sampling equations predictive of the AUC24 of each drug in the three different conditions. All possible combinations within the groups of one to three time points were evaluated, i.e. 11 combinations with one time point, 55 combinations with two time points, and 165 combinations with three time points. Assumptions of linear regression were assessed using R, i.e. normality of the dependent variable, linear relationship, error normality, multicollinearity and homoscedasticity. Using best subset selection, we selected the best-performing OSS for each drug and condition separately, for the simultaneous use of all drugs in each condition, and for the simultaneous use of all drugs after oral administration (either the fasting or fed condition). In addition, we tested the OSS from simultaneous prediction of the fasting and fed conditions following intravenous administration to examine whether the OSS was also suitable for application in intravenous administration. The average adjusted R2 for all combinations comprising one, two, or three samples were calculated to investigate the correlation between the predicted AUC24 (AUC24,predicted) using multiple linear regression and AUC24,calculated. With a time resolution of 1 h, the best OSS was selected based on the highest average adjusted R2 combined with an acceptable bias and precision. To validate the OSS model, residuals for each patient were calculated using a jackknife analysis [16, 22]. All 20 patients were omitted, on a one-by-one basis, and the OSS using best subset selection was calculated for the 19 remaining patients in each scenario, as described above. The AUC24,predicted and corresponding residuals were then calculated for the omitted patient. OSS was considered acceptable if bias and imprecision were smaller than 5% and 15%, respectively [15, 16, 23]. A percentage prediction error (PPE), calculated as [100% × (AUC24,predicted − AUC24,calculated)/AUC24,calculated], was used to show the performance of OSS equations from each individual [24, 26]. An acceptable PPE was considered smaller than 15% [24, 26], and the number of patients with a PPE < 15% was calculated for the best-performing OSS. Data analysis was carried out using R version 3.3.2 (The R Foundation, Austria, Vienna). To test whether the selected OSS was capable of predicting the AUC24 in other patient groups, an external validation group was selected. This external validation group was the population in which Magis-Escurra et al. developed an OSS for the first-line drugs and also moxifloxacin. Study subjects were TB patients admitted to the two Dutch TB referral centres, i.e. Radboud University Medical Centre, Nijmegen, Centre for Chronic Diseases Dekkerswald, Groesbeek, The Netherlands, and the UMCG, Tuberculosis Center Beatrixoord, Haren, The Netherlands. Forty-one adult patients were included after providing written informed consent. The included patients received isoniazid 5 mg/kg, rifampicin 10 mg/kg, ethambutol 15 mg/kg and pyrazinamide 25 mg/kg. A full PK curve was recorded during the intensive phase of TB treatment after steady state had been reached (≥ 2 weeks). Patients refrained from food intake from 23 h on the day preceding the PK assessment until 4 h after intake of the study medication. Serial venous blood samples were collected just prior to and at 1, 1.5, 2, 2.5, 3, 4, 6, 8, 12 and 24 h after witnessed intake of the study medication. Plasma was separated immediately, frozen at −80 °C and transported on dry ice for bioanalysis. Plasma concentrations of rifampicin, ethambutol and pyrazinamide were analysed at the University Medical Centre Nijmegen using validated high-performance liquid chromatography (HPLC) methods as described previously . Plasma concentrations of isoniazid were determined at the UMCG using the validated LC–MS/MS method mentioned earlier . The AUC24,calculated was calculated using WinNonlin (further information can be found in the original study ), while the AUC24,predicted was calculated using the best-performing OSS formula in the fasting condition. For the external group, the same PPE < 15% was considered acceptable, and the number of patients with a PPE < 15% was calculated. Patient characteristics for both groups are presented in Table 1. The assumptions of linear regression for OSS analysis were fulfilled. Table 2 shows the best-performing one, two, and three time-point equations of the four first-line TB drugs individually when administered intravenously or in fasted or fed conditions. Only imprecision of the AUC prediction of ethambutol in the fed condition was higher than the preset limit of 15%. Table 3 presents the best-performing equations for the simultaneous prediction of exposure of all drugs when administered in different conditions, i.e. either intravenously or fasting or fed conditions. Again, only imprecision of ethambutol in the fed condition did not meet the requirements. The time points 0, 5, and 8 h post-dose showed the best prediction for intravenous administration of isoniazid, rifampicin and ethambutol. In the fed condition, sampling times at 1, 2 and 8 h post-dose were the best predictive factors, while in the fasting condition, sampling time points at 2, 4, and 8 h post-dose provided the best prediction. Table 4 shows the best-performing equations for simultaneous predictions of all first-line drugs administered orally, either in the fasting or fed condition. It can be observed that after oral administration, C2, C4 and C8 are nicely distributed over the absorption, distribution and elimination phase, leading to an adequate AUC24 estimation. The bias and imprecision were acceptable for almost all drugs. We did not calculate the best OSS combined for all three conditions because clinicians will only occasionally combine oral and intravenous administrations. However, when we tested this best-performing OSS (OSS2-4-8) following intravenous administration, we found that this OSS showed bias and imprecision that was comparable with OSS0-5-8, indicating that it was also suitable for accurately estimating the AUC24 for intravenous isoniazid, rifampicin and ethambutol (Table 3). Thus, OSS2-4-8 can be used for either oral or intravenous administration. Table 5 shows the median PPE (range) and number of patients with a PPE < 15%. We showed that ≥ 70% of patients in the OSS group (for all drugs and oral conditions) had an acceptable PPE value, except for ethambutol in the fed condition. In the external validation group, OSS2-4-8 could correctly predict 79% and 88% of the individual AUC24 of ethambutol and pyrazinamide, respectively, but in only 50% and 23% of the individual AUC24 of isoniazid and rifampicin, respectively. To our knowledge, this is the first study to develop an OSS for the prediction of AUC24 of first-line anti-TB drugs in early treatment and in different conditions. OSS2-4-8 accurately estimated AUC24 for first-line anti-TB drugs after oral administration in early treatment. If we compare our data with the only study that described an OSS for all first-line anti-TB drugs, several differences can be observed (Table 6) . Apart from the differences already mentioned in the Introduction on feeding conditions and time restrictions, the earlier study included a more variable population with regard to ethnicity and patients from referral TB centres. Meanwhile, in this study, we included only regular outpatients of Asian ethnicity (Table 1). With regard to isoniazid, Cojutti et al. determined and validated an OSS at 1, 2 and 9 h after dosing in a large population, consisting of 100 patients for the modelling group and 85 for the validation group  (Table 6). Our proposed time point of 8 h post-dose is comparable with that of Cojutti et al., indicating that a rather late time point is capable of better predicting AUC24 . In another publication by the same group, a threshold of 55 mg × h/L for toxicity of isoniazid has been proposed . In none of our patients, in either the OSS or external validation groups, was such a high AUC24 observed, possibly due to the fact that the majority of the included patients were fast acetylators. Rifampicin shows auto-induction that is complete after 20–30 days . Auto-induction might influence the OSS as PK properties may change. This was indeed shown in our OSS group experiencing a higher AUC24 (range 36–129 mg × h/L) than AUC24 in steady-state patients . However, the AUC24 was not in the range (166–321 mg × h/L) of the high dose rifampicin, i.e. up to 35 mg/kg . The external validation using steady-state patients did not succeed for rifampicin as the majority of patients showed a PPE > 15% (Table 5). It is apparently difficult to predict the complex PK of rifampicin based on early measurements. For this drug, we suggest using an OSS based on a population PK model . Regarding the internal jackknife validation, the prediction of ethambutol was the most difficult and OSS2-4-8 was unable to accurately predict a high percentage of individual AUCs (Table 5). However, TDM of ethambutol is rarely performed, and if performed, it is usually in cases of decreased renal function, trying to limit toxicity . Following on from this, ethambutol is mainly used to prevent the emergence of resistance developing for isoniazid and rifampicin. We believe the lower precision in the prediction of AUC24 of ethambutol is acceptable in daily practice. It was striking that OSS2-4-8 predicted AUC24 of ethambutol rather well in the external validation group (Table 5). The AUC24 of pyrazinamide has not been linked to toxicity . Although the relationship between pyrazinamide dose and hepatotoxicity remains debatable, it appears that doses over 50 mg/kg may compromise patient safety. Current dosing of pyrazinamide also appears to be on the lower side of effective . OSS2-4-8 well-predicted the AUC24 of pyrazinamide in the external validation group, although the drug had not reached steady state in the first 3 days of treatment. Therefore, OSS2-4-8 can be used to estimate the AUC24 of pyrazinamide in other patient groups. We calculated linear regression equations for OSS for all time points included in the study, for one to three time points, leading to 231 equations per drug and condition. Several equations are comparable in terms of bias and precision and can be used with the same extent of confidence. To be able to widely implement TDM, it would be beneficial to make all equations electronically available, e.g. in an application (app). The user would easily calculate the AUC24 by entering data regarding sampling times, concentration, type of drugs, administration route and condition. There are several limitations to this study. Although the sample size can be considered standard for intensive PK studies, it was relatively small for an OSS study. To calculate the AUC24,calculated, a limited number of samples were drawn in the elimination phase of the drugs, possibly resulting in an over- or underestimation of the true AUC24. We believe this deviation is acceptable as rich sampling, especially in the elimination phase, is hardly ever performed in daily practice. We internally validated the OSS equations using the jackknife method instead of a prospective validation with new subjects. However, this method is appropriate for small sample sizes and effectively eliminates the major influence of a particular subject . The number of patients (n =8) in the external validation group for isoniazid was too small to draw a conclusion on the external validity of OSS2-4-8. One might argue that OSS should have been developed using validated population PK models. In our opinion, both strategies have advantages and disadvantages. A Bayesian approach using a population PK model is more flexible, allowing for deviations from the exact sampling times. A disadvantage is the use of software and use of the model, whereas multiple linear regression formulas yield straightforward equations to fill in . Lastly, sampling took place in the first 3 days of treatment, thus none of the drugs reached steady state. However, we believe that performing TDM early on in the treatment phase could be of importance for isoniazid as this drug is most active in the first 3 days of treatment because of its high early bactericidal activity . If one waits until steady state, precious time is missed to optimize isoniazid treatment . In the early days of TB treatment, an OSS at 2, 4 and 8 h post-dose adequately predicted the AUC24 of first-line anti-TB drugs in fasting or fed conditions. The external validation group for isoniazid was too small to draw a conclusion, and, for rifampicin, showed that OSS2-4-8 was unable to accurately predict AUC24 in patients in the steady state phase of treatment. OSS2-4-8 was able to predict the AUC24 of ethambutol and pyrazinamide with sufficient accuracy and precision. We believe that our OSS strategy may be a useful tool for optimizing exposure of first-line anti-TB drugs, although well-defined PK/PD targets of efficacy or toxicity are still lacking. The authors thank all study participants for their participation in this PK study. The PK study NCT02121314 was funded by the Directorate General of Higher Education of Indonesia. AMS, MGGS, YS, JWCA, TSW, YWS, S, REA, CM-E and JGWK wrote the manuscript; JWCA, MGGS, TSW, JGWK and AMS designed the research; and MGGS, AMS, MH, AS and JWCA analysed and interpreted the data.